Known as being ‘lost’ due to its period of inactivity and overgrowth during the Second World War, Heligan is a beautiful spot near Mevagissey, with acres of both productive plants and pleasure grounds, which you will not regret discovering. The shop and multiple cafés are great for picking up souvenirs or something to eat, and the towering bamboo and canopies of exotic plants make for some great photo opportunities. Walking the whole loop is a highly rewarding experience, with emus, sea views and for visitors with a toleration for heights, the longest Burmese Rope Bridge in Britain. There are also a number of sculptures, including The Giant’s Head, Mud Maid and Grey Lady. 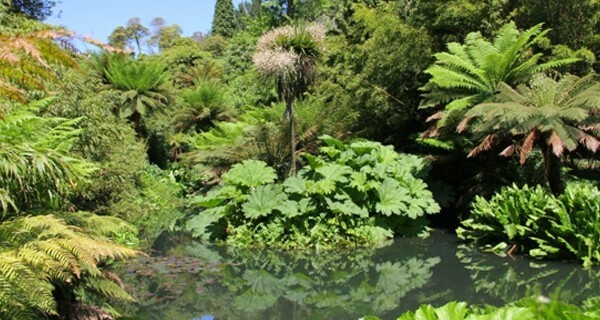 The Lost Gardens of Heligan are a 30 minute drive from Fowey. Small in size but tremendous in beauty, Fowey’s Hidden Valley Gardens cover just 3 acres to explore and a nursery to purchase any plants that take your fancy too. It’s open between 20th March and 15th October, and boasts a large variety of lovely plants that bloom throughout the season. Facilities include a ‘Tea Hut’ for refreshments, and picnic tables to take your own lunch and enjoy it in the serene surroundings. The Hidden Valley Gardens are a 15 minute drive from Fowey. The Eden Project emerged from a china clay quarry, and now hosts miles of trails to explore, both inside and out. Transport yourself to the warmth of the tropics by spending your day following the paths within the biomes, where exotic trees and tropical plants thrive in the rainforest-like conditions. Make sure you leave enough time for some lunch or a tea and cake break though, the Eden Kitchen is not to be missed! 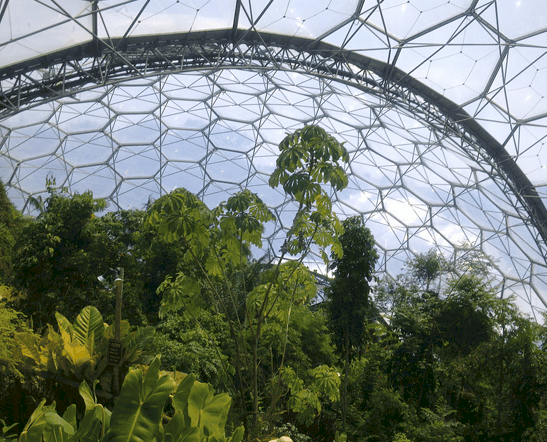 The Eden Project is a 15 minute drive from Fowey. A self-proclaimed ‘sub-tropical paradise with a stunning coastal backdrop’, it’s no surprise that Trebah is ranked among the eighty finest gardens in the world. From the entrance at the very top, Trebah’s gardens inhabit a beautiful valley, filled with ferns, giant gunnera, towering bamboo and 100-year-old rhododendrons, eventually reaching Polgwidden Cove, a sheltered, private beach with views of Helford River and Falmouth Bay. They also host performances of live theatre, music and dance within their new amphitheatre and throughout the gardens. Trebah Garden is an hour and 10 minutes drive from Fowey. The National Trust’s Lanhydrock Estate is an enchanting late Victorian country house with extensive gardens and woodland. There is a real element of grandeur to Lanhydrock’s grounds, which have been lovingly developed since the 17th century. You can explore the gardens at your own pace, or join a free guided tour which take place throughout the summer. Lanhydrock also hosts outdoor theatre performances, dates and details for which are available on their website. The house is closed during the winter for maintenance, but the gardens, shop and cafe are open all year round. Lanhydrock is a 20 minute drive from Fowey. 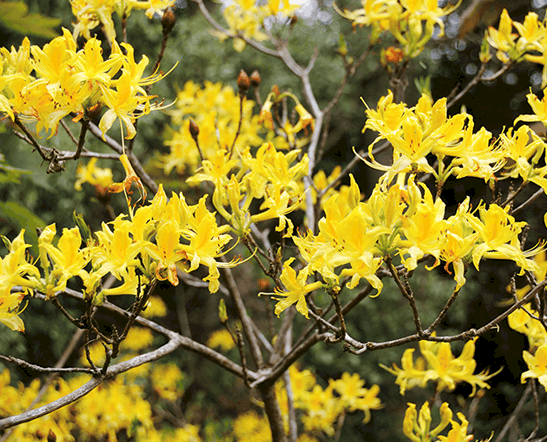 Tregothnan offers pre-booked, monthly guided tours and lectures for visitors wanting to explore the botanical garden’s grounds, with an annual charity opening over a weekend which takes place in April each year. It is also the first producer of English tea, and holds events, tastings, and masterclasses, all revolving around England’s favourite hot drink. There are even hives of bees that inhabit the gardens, with one-day bee-keeping workshops on offer. Tregothnan is a 55 minute drive from Fowey. Pencarrow’s grounds are a combination of formal landscaping and woodland trails, perfect for the garden specialist or leisurely walker. It also has wheelchair access. There are more than 600 varieties of camellias and rhododendrons that bloom in March, and begin the floral cycle of the year, with the garden blossoming and flowering continuously throughout the summer months. Spare some time to explore Pencarrow House; a largely Georgian mansion and a beautiful slice of Cornish history. It is still occupied by the Molesworths, descendants of the family who settled there in the 1500s. Pencarrow is a 35 minute drive from Fowey.